Researching a vehicle’s past is as much an art as it is a skill. It takes patience, persistence, and perseverance. It takes help from willing strangers—and a lot of time. It takes an outgoing personality to reach out to people who might have crossed paths with your car or motorcycle. 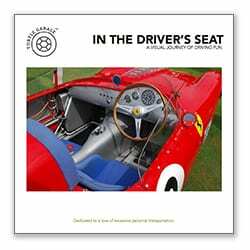 To be a good researcher of vehicle history you have to be part detective and part reporter. Most of all you need a little luck. At the Revs Institute symposium last March we learned the vital importance of research, provenance, history, and documentation as a key driver of a given vehicle’s historical significance—and ultimate value. 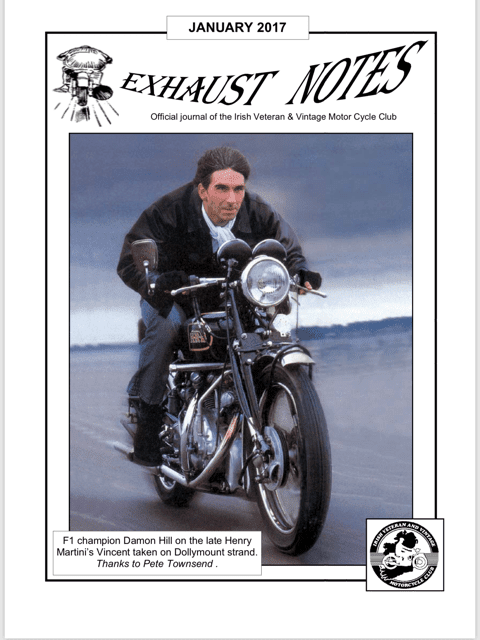 Overall condition is paramount to determining initial value, however, having proper historical records and documentation can dramatically increase the intrinsic value of a given car or motorcycle. Collector vehicles without a comprehensively documented history will never attain top dollar in the market. To the discerning and sophisticated collector, provenance trumps all else. 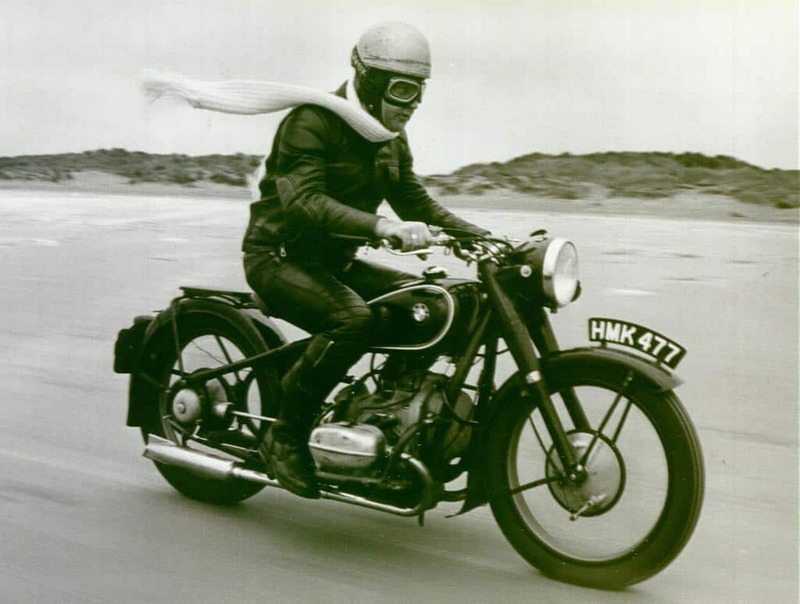 When I purchased my 1937 BMW R5 back in 2001, the Pendaflex file folder that came with it was full of old paperwork. It took me years to untangle all the data within the tattered, fat, and disorganized folder. 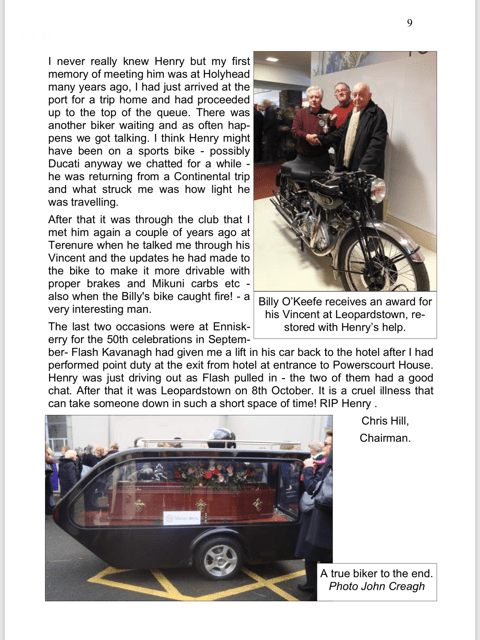 One name inside ultimately yielded the key to many facts about the history of my BMW R5 (British registration plate HMK 477). From this folder of treasures, I was able to track down a prior owner of the R5 in the U.K. His name was Robert Freeman. Robert has been the subject of several posts within this blog and he crossed the Atlantic Ocean in to attend the 2017 Turtle Invitational. Over the last decade, Robert and I have carefully reconstructed the history of HMK 477 from new—we were able to trace its ownership chain from the beginning and get both BMW (manufacturer) and AFN (dealer) certification. We even have service records dating back to 1938. The entire history of this rare machine can be read here. Wow. I love the internet. It links everyone so quickly! I’m not sure how the photo shoot came about..but it was definitely The Irish Times newspaper and I think the late Jack McManus a classic old school newspaper B+W photographer. I worked there in Marketing and was very involved with vintage Jaguars in my youth. I bought back my Granddad’s 1959 Mk IX in 1990 and went to all the rallies, shows, Beaulieu etc. I personally have only ever owned a Honda 70 in my teens and have never owned a two-wheel motor since! Blasphemy. I’m trying to clear out some old memorabilia from my attic and came across this large print of Henry. I think one of the photographers got me a blow up after it had appeared in print and I liked it so much. As Henry has sadly passed away now, I traced his eldest son Karl in Malaga and he would love my original B+W of Henry roaring along on HMK 477. He is a commercial photographer and was delighted I contacted him about his late father and this iconic pic. I will be in touch soon about a copy of the print. As for finding out if there are any other pics from the photoshoot…the best bet would be to email The Irish Times, Tara Street, Dublin 2. Photo sales department. Most of the photographers that were there in the 80’s and 90’s are retired or like Jack, passed away, but two to try would be Frank Miller or Brenda Fitzsimmons. Attached is a pic of the rear of my print with the Irish Times copyright stamp and handwritten negative code which may help you tracing all the negatives from the beach photoshoot. 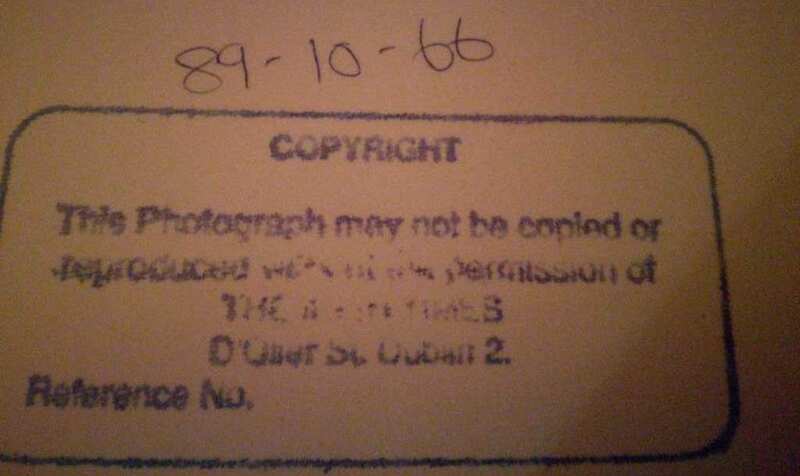 The actual record number of the negative on the stamp on the back of Peter Moorehead’s original print of Tom Lawlor’s photograph of Henry Martini on my R5. Published—Page 2 (inside front), Saturday, October 7th, 1989. Photo Caption—Mr. Henry Martini rides out on a 1937 500cc R5 BMW motorcycle yesterday on Dollymount Strand in preparation for today’s annual Gathering of Motorcycles in the Grand Hotel, Malahide. This is the actual screenshot of the article that ran in the Irish Times in 1989. We are now doing the work to get a contact sheet for the entire photoshoot. This would yield yet even more history and images. 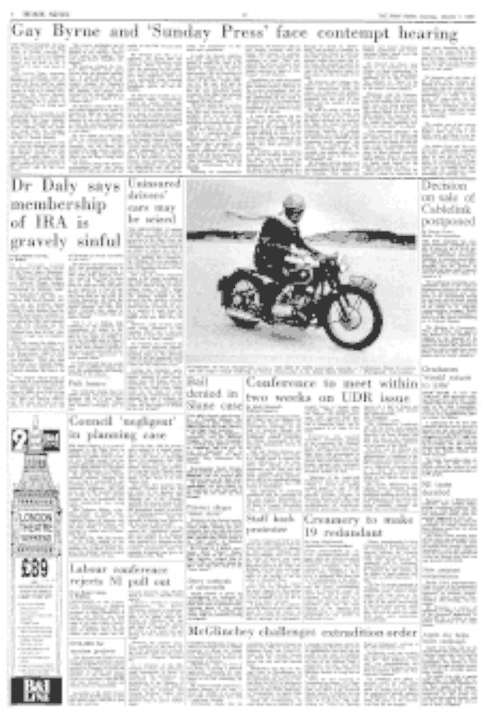 We also understand that there are several stories about the motorcycle photo shoot that day on Dollymount Strand. 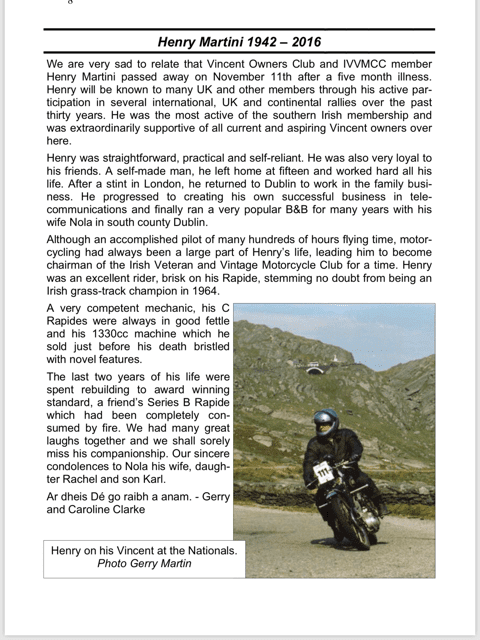 Peter recently wrote to me that there may be more to the story, “I do think there was a funny story of Tom Lawlor riding along backward wedged into a sidecar ahead of Henry on the R5 trying to capture ‘The shot’…he certainly did that with the scarf swishing in the sea breeze.” Over the coming months, we hope to uncover even more information about the Irish Times article and photo shoot that featured HMK 477 in the October 7th, 1989 issue. If we are lucky we might even secure an original copy of the photograph signed by the photographer Tom Lawlor. Through this process, we obtained Henri Martini’s obituary which yields further precious details about the ownership history of HMK 477. This is how it goes: You uncover something and it leads to more and more information. You follow down every possible lead. There are a lot of dead ends but eventually, dots start to connect and a full history emerges. In the case of HMK 477, the history we uncovered spans eight decades. That’s part of what collectible cars so highly sought after. Besides their natural beauty, they have such a rich story behind them that is usually as rich and detailed as the car itself. Thank you for sharing! Great post, Phil. I loved the quote in the VOC dedication of Mr. Martini, describing his C Rapide as being “always in good fettle”. Wow, this is fantastic! That’s such a great photo, and even better with knowing the story behind it. Happy New Year to the Turtle Garage!